You might remember that a few months back I wrote about One Thing, a pitch we put forward at the BBC Knowledge & Learning Connected Studio, along with Kai En Ong from the BBC. Well, not only did our initial pitch get put through to Build Studio, our team efforts there were also a success and we were delighted to be offered the chance to work on a full pilot for One Thing. To briefly recap, One Thing aims to do one thing: send you something topical to learn about every day, lightly personalised based on what you’ve liked before. It works to combine the best of BBC content to send you a daily package of knowledge from across the BBC, straight to your mobile. For the pilot, we decided the best course of action was to reuse the existing HTML5 web app we’d built at the Build Studio, rather than to actually build a real native app. Once we’d finalised the content (which currently comes from the BBC’s /education), Kai made some design changes to better fit the new content and onward journeys. You can see from the screenshots that the user gets an educational clip, along with some background information. 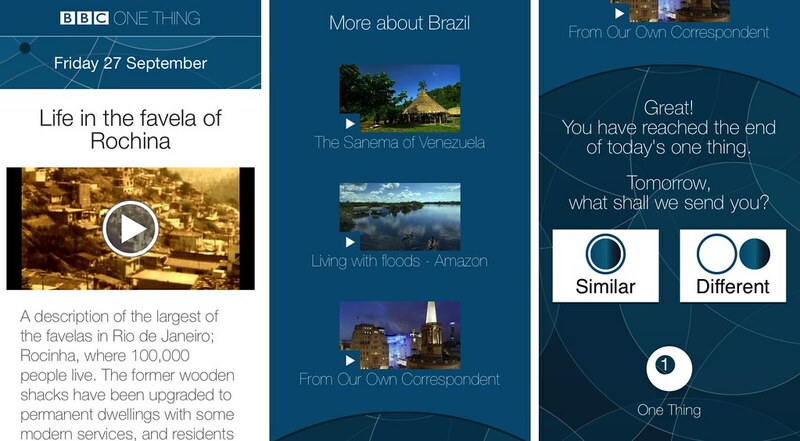 We then link to BBC programmes that are about the topic we think is most relevant to the clip. The user then has the option to tune their content by telling us whether next time they’d like something similar or different. So what do those buttons do? Well, it all starts with what’s topical. We extended our article ingest service Yuri to regularly ingest from BBC News and perform topic extraction that determines what topics articles are about. 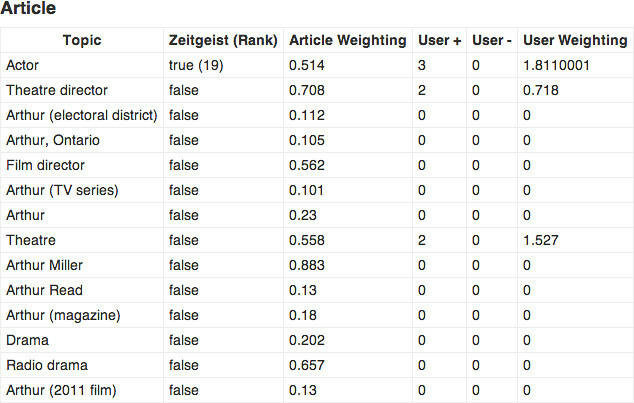 We then used our Zeitgeist service to count the topics on current BBC News articles to produce a top 20 list of what topics are currently in the news. We then generate a list of candidate content which has one or more of the current topical topics. But here’s the key bit. We then order this list of candidate content based on previous user feedback for those topics. One Thing, though the source of many puns in the office, has been a fantastic project to work on. I’ve personally really enjoyed the Connected Studio process and it’s been a great opportunity to collaborate as team with people from the BBC on a new idea, from inception to full prototype. As we wait to find out where One Thing goes from here, some of the work we’ve done to extend Yuri is already being put to use elsewhere. For more on that, see Oana’s post on performing people extraction and automatic linking from news articles to programmes.